You don’t see many samurai films these days. Akira Kurosawa basically built the genre in the 40’s and 50’s and filmmakers are still struggling to catch up. 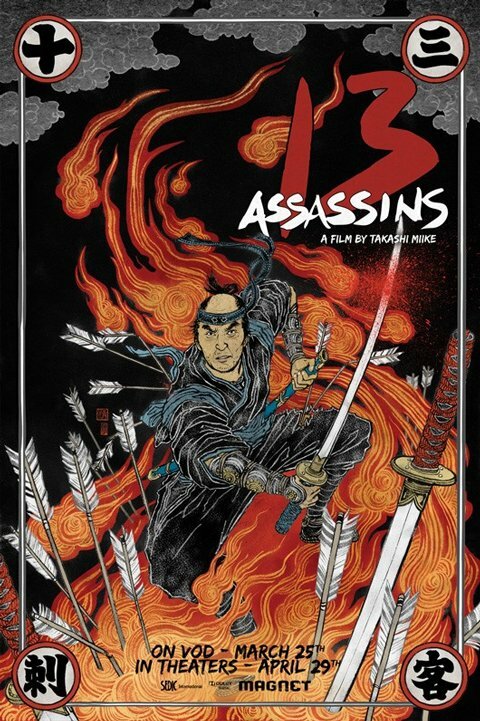 One director about to take a stab at it is Takashi Miike, whose next film 13 Assassins will hit VOD March 25th and theaters April 29th. A fresh new illustrated poster for the film has appeared over at Cinematical looking more like the cover of a graphic novel than a poster. Presumably the lone warrior pictured is one of the 13 samurai that band together in hopes of overthrowing an evil lord. The image seems like a mix of traditional and modern art styles combining to create a unique but effective look for the poster. Miike’s films frequently find their way into the American horror mainstream. His films like Audtion, Ichi the Killer and Gozu are all classic films you’ll probably recognize. His films are masterfully crafted and 13 Assassins looks to be no different. Scope out the poster below and be ready to pick up your swords when the film hits later this month.